Thank you for your trust in our company and for buying the new Energy Outdoor Box Street. Before you start using your speaker, we strongly recommend to read this manual to get used to it. This speaker is splashproof, not waterproof. It cannot resist jets of water. Close the cover flap that protects the ports properly when the device is exposed to moisture. Do not disassemble the device. All repair works should be carried out exclusively by qualified staff of Energy Sistem Technology, S.A. Turn it off when you are not using it and do not let it completely discharged for a long time. MicroSD and USB decoder: reads MP3/ WAV files from external storage units (up to 128 GB) with FAT/ FAT32 file system. * This value is approximate. The battery life depends on the selected volume level and type of music. Press and hold the On/ Off button (1) for 2 seconds to turn on the device. You will see that the Function indicator (7) lights up. You will also hear a confirmation sound when switching on the device. When the battery level is below 10%, you will hear a sound to remind you to charge it. Please connect the cable of the provided power adapter to the Power input (12) of your Energy Outdoor Box. Plug then the power adapter into your home power socket. The Charge indicator (1) lights up and switches off once the charging process has been completed. The charging time is approximately 5 hours. Only use the power adapter provided with the product. Turn off the device before charging it to optimise the charging process. Do not leave your Energy Outdoor Box completely discharged for a long time. Once Bluetooth mode is enabled, press and hold the Change function button (2) for 2 seconds to start searching for Bluetooth devices. Access the list of available devices on your smartphone or tablet and once there, select your "Energy Outdoor Box Street". 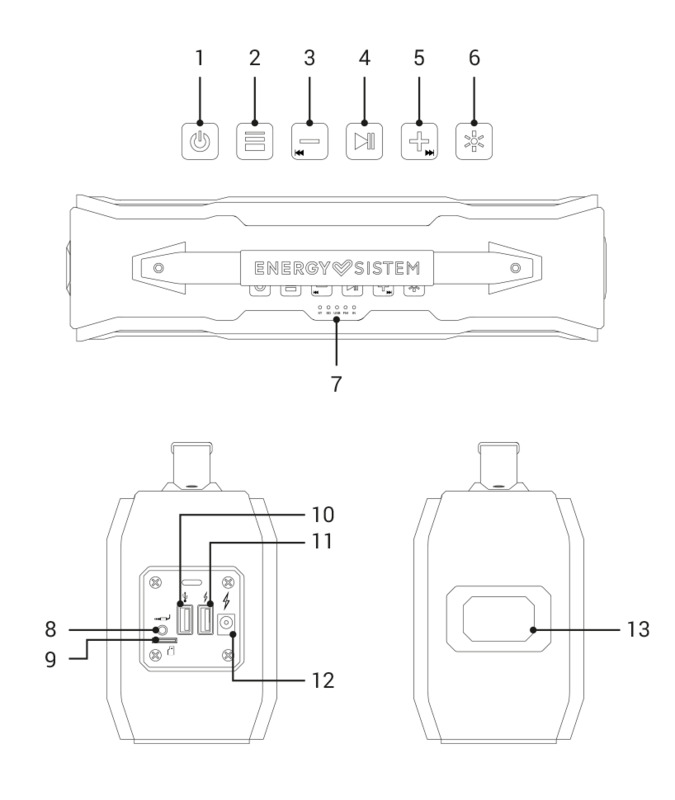 The devices will be connected without codes. Once the connection has been established, you will hear a confirmation sound. At this point, you will be able to start playback on your smartphone or tablet. The Bluetooth connection range is up to 10 meters. Control playback from the speaker by pressing Next (5), Back (3) and Play/ Pause (4). Your speaker saves the last connected device and pairs with it automatically when you turn on the speaker once again. Once FM radio mode is enabled, press and hold the Change function button (2) for 2 seconds to start searching for FM radio stations. The process may take a few minutes. Once the search has been completed, press and hold Next (5) or Back (3) to select the radio station you want to hear from all saved radio stations. Your Energy Outdoor Box Street saves the last selected radio station when you turn it off and on once again. Play .mp3 and .wav files from your microSD cards (up to 128 GB). The contents play automatically a few seconds after inserting the microSD card or USB stick. Press Next (5) or Back (3) to move to the next or previous song. The folders and files of your external cards or sticks will be read in chronological order. Press and hold Play/ Pause (4) for 2 seconds to enable shuffle mode. You will hear a sound to confirm this option has been enabled or disabled. 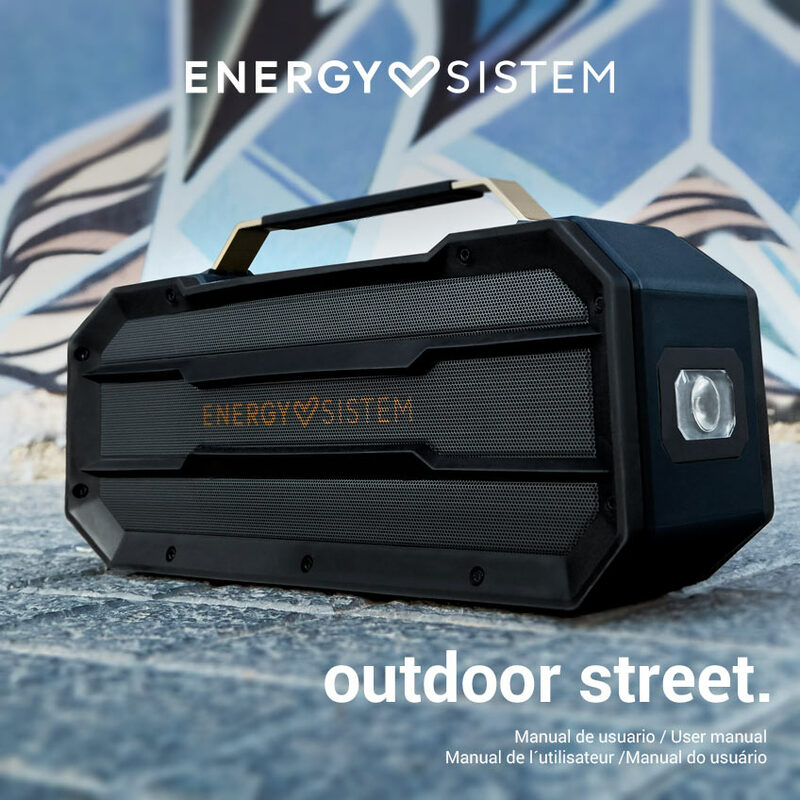 Your Energy Outdoor Box Street also features a 3.5 mm mini jack input (8) to connect your external devices using the provided audio cable. Important: It is not possible to control music playback from the speaker while using this mode. To control playback functions you will have to use the connected music player. Press and hold Torch (13) to start a SOS Morse code (distress signal). Press this button once again and it will stop. This warranty covers any defects in workmanship or materials and does not cover any product failure due to accidents, misuse or alteration made by an unauthorized person. Important: This warranty does not cover any damage or loss of data stored in warranty products. Therefore, Energy Sistem's Technical Support will not assume any loss of the above mentioned information. In this respect it is recommended that you make a backup of your data and remove any personal data from the product's internal memory before you send it or send it only with the original data. Trademarks. All company, brand and product names are trademarks or registered trademarks of their respective companies. Specifications are subject to change without notice. © 2019 by Energy Sistem Technology, S.A. All rights reserved. in conformity with the provisions of the Directive 2014/53/EU of the European Parliament and of the Council of 16th April 2014.